Product Temp - Air powered pressure test pumps and equipment. 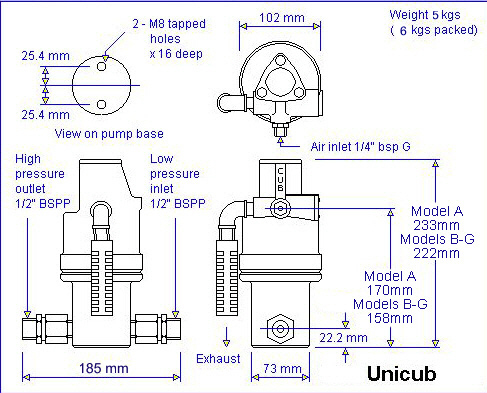 For the smaller applications where little or no output flow is required the Uni-Cub offers a cost effective solution. • Seven models ranging from 28 bar to 1,090 bar. • Stainless steel wetted parts. • Suitable for pumping water, oil and a wide range of fluids. • Volume outputs from 0 to 14 litres/minute. • Automatic stall against closed outlet with no air consumption, automatic restart. • Minimum air pressure required to start pump will be up to 1 bar. • Powered by any fixed or portable compressed air source to 7 bar. • Infinitely variable capacity and discharge pressure through simple regulation of air supply. • Available in portable pressure test packages (see 'TEST RIGS AND POWERPACKS') . • Measures only 233mm high x 156mm diameter. PRESSURE TESTING: Static and burst testing of hoses, valves, tubing, testing of fire extinguishers, gas bottles, pressure vessels, hydraulic circuits and components, aircraft and automobile braking systems, pipeline testing, wellheads. GENERAL HYDRAULICS: Power source for hydraulic rams and cylinders, scissor lifts, jacks, hydraulic presses, clamping systems, bolt cutters, bolt tensioners, axle lifts, ramps, mobile power supplies. PROCESS INDUSTRY: Isostatic presses, component life tests, chemical injection, etching machines, spraying equipment, lamination processes, impregnation machines. CONSTRUCTION AND MINING: Grit blasting equipment, rock breakers, pressure cutters/washers, rock drills, injection equipment.